Scottish geologist, illustrator, and speculative zoologist Dougal Dixon has made his career dreaming up dozens of fictional creatures shaped by evolution gone bonkers. Here are 10 of his creations who seemingly escaped from the Dungeons & Dragons Monster Manual. — After Man: A Zoology of the Future (1981), which details the rise of rodents and other critters 50 million years from now. — The New Dinosaurs: An Alternative Evolution (1988), which is about a world where the K-T extinction event never happened. — Man After Man: An Anthropology of the Future (1990), a book about man's genetically engineered descendants. — The Future Is Wild (2003), a documentary similar to After Man, but about monkey-like tree squids. Most of Dixon's chimeras resemble modern-day creatures, as they occupy evolutionary niches familiar to modern-day humans. 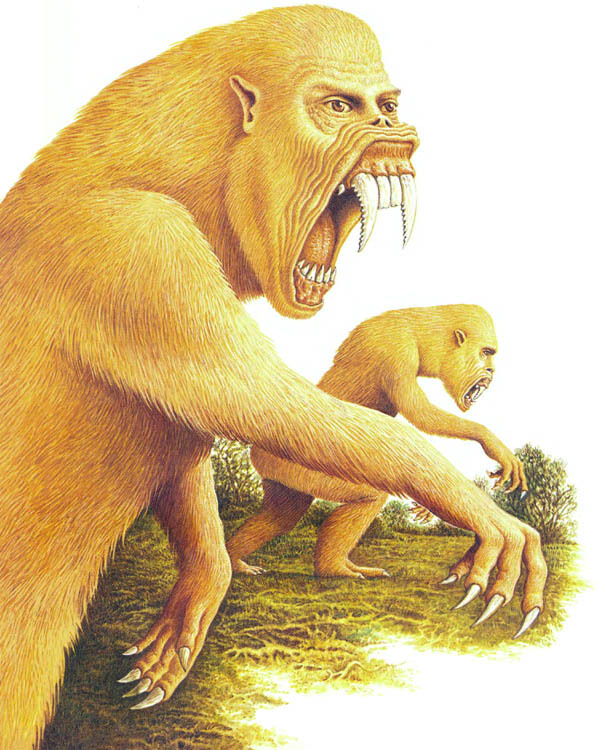 But some of his speculative beasts are unadulterated nightmare fuel (Man After Man is by far the worst, what with its sabertooth yetis and other horrors). The following 10 creations will make you pray for a robot uprising and a supervolcano...at the same time. In Man After Man, genetically superior humans abandon a polluted Earth to colonize space. The remaining Homo sapiens tinker with their gene codes for a thousand years to achieve immortality. One such species is the Tic, who graft back-up organs and limbs onto their bodies like Mr. Potato-Head made flesh. *Speaking of which, you can watch stop-motion versions of these horror apes from a Japanese documentary based on After Man. Meanwhile in Australia, the slobber — a barely moving, blind, marsupial sloth that catches insects with strands of mucous and is covered in parasitic algae — grows its young out of its torso. This creature lost the genetic lottery a hundered times over. 200 million years in the future, a giant slime mold consumes flying fish in the northern forests of a new Pangea-like continent. It looks like the set of the Super Mario Bros. movie and enjoys traveling in giant forest squids' brains. So yeah, the future will be written by Gary Gygax and H.P. Lovecraft. This one's more depressing than unpalatable. The gourmand is the future relative of the Tyrannosaurus Rex — it's a 60-foot-long, 15-ton armless scavenger that wanders around the South American pampas, consuming found corpses and sleeping. I mean, paleontologists are already calling the T-Rex's badass credentials into question, but it's disheartening to think that it would eventually evolve into the latter-day Orson Welles of the dinosaur world. 200 years from now, mankind will build starships in the vacuum of space with the help of genetically engineered star-humans. Apparently when we're building lifeboats to save the human race, some of us will become genital-less sentient bocce balls. 50 million years from now, Hawaii will be overrun by flightless carnivore bats who eat anything with a pulse. It will be hell. There's nothing wrong with this 10-foot-long hypsilophodont that roams the Russian coniferous forests, other than the fact that it's seemingly the Joe Camel of saurians. I motion to rename it "Erectodon." 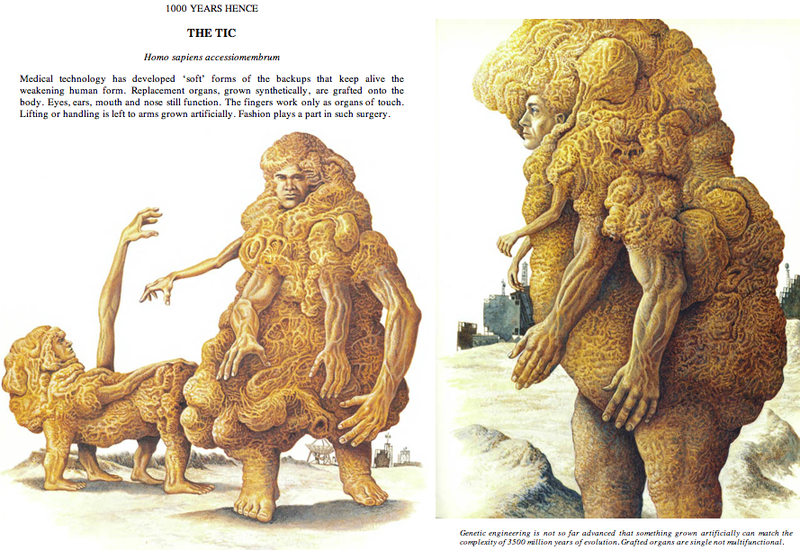 One of the recurring humanoids in Man After Man are a colony of genetically engineered symbiotic yetis (don't ask). 2 million years from now, this relationship will turn parasitic and gross everyone out. ...and this guy, who is a sentient pile of suet. Three cheers for natural selection, everyone.